High security provided by our smart electronic safe promotes guest satisfaction on one hand and helps avoid client's claims and lawsuits on the other hand. In-room safes protect its guest and traveler’s privacy and provide them a secure location for belongings such as Laptop, Jewelry, Camera, etc. 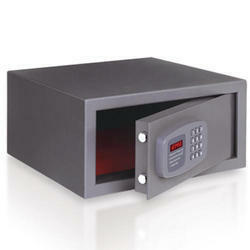 Safes with mechanical override key can be easy to break to; all keys can be copied, keys are frequently lost or stolen. If a master key is lost, you will be required to change all the hotel cylinders; this is a security risk. Electronic safes overcome these issues with smart and advanced technology providing high security for you and for your guests. 500 audit records tracking recent actions performed in the safe, increasing hotel and guest security. Compatible with Pedestal- Safe place offers a Pedestal if the room has no shelf, closet or other place to install the safe. The pedestal offers an easy installation location at a comfortable height for easy use of the safe. Flash memory- All codes and vital information are safely stored on a Flash Memory Chip, and cannot be lost if batteries are low or have been replaced. Anti Tamper Labyrinth prevents access and manipulation of the internal mechanism and electronics, offering an additional security feature to your hotel room. Solid electronic safe and service units are programmed for a specific property. There is no universal tool which can be used in other hotels. Easy safe programming- DIY without the need of third party. Only you know the internal password and the features you selected. This provides a higher security level for the hotel, cruise ship, university, etc. Audit Trail- Reports important information, up to 500 latest events stored with time and date. If and when a guest claim appears, it enables you to identify users and actions made in the safe at each moment. The events can be viewed and printed using the Ulti Max or stored on file for later printing. Unique mechanism structure enhances the safe protection against physical intrusion. Power outlet for laptop recharging. K-BE200 Dimensions (L*W*H) 420*380*200 For the Logger Unit, it can read and print 100 records about open and close safes, it's about 33USD/ UNIT, i can apply one free for you when order more than 100 unit safes. • For our safes clean picture, pls find them as attached. • For emergency tool , for example, we forget our guest code when safes door is closed, we have other three ways to open, like master code/ emergency key/ Logger unit. Simple for guests to understand and use - there are no complex instructions. 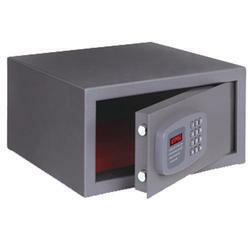 The safe is operated by a convenient 4-6 digit personal code, chosen by the user. To lock the safe, the User simply closes the door, enters any 4-6 digit number and presses the "LOCK" key. 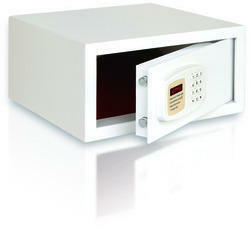 The safe will automatically lock and the word "CLOSED" appears on the digital display - the safe is security locked. To open the safe, simply enter the same code. 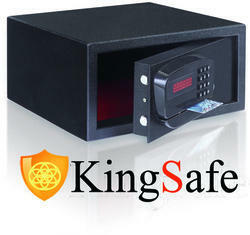 KingSafe stands apart with a commitment to exceptional craftsmanship and the highest security standards. 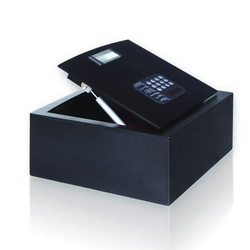 Offering the widest selection of product, our electronic safes are designed with modular components including digital keypad, CPU and locking mechanism. What does this mean to you? Hotel staff can replace a door in seconds or individually components can be addressed when needed. In return, hotel guests benefit with a reliable and durable safe at their fingertips. Our user-friendly, illuminated keypad makes for easy viewing especially in closet areas. Safemark's popular Emergency Handheld Override (EHO) is not only industrial strength, but easy to learn and simple to operate. Your hotel can obtain the ultimate peace of mind by choosing our UL-Rated High Security Medeco Fail-Safe Override Key System. Selecting the Right Electronic Safe for your Hotel. Problem: Many safe providers send conflicting information by using images of branded properties in their marketing materials, when in fact, they are not approved and/or do not meet the specification guidelines. Solution: Save yourself time and money by tapping into research performed by major hotel brands and select a safe partner that is approved and utilized throughout their portfolio. Problem: Valuable time is often wasted trying to solve a theft due to ambiguous information. 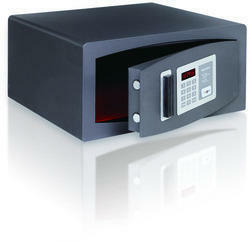 Many safes on the market only reflect a user number (i.e. User #1). Worse yet, they only track safe "openings" and not "closings" which is a critical piece when dealing with a guest's missing valuables. Solution: Remove the worry of loosing vital safe codes and the costly expense of drilling locked safes by embracing a safe solution with multiple back-up options (i.e. hotel server, secondary PC, and/or CD). An override that has lost its programming due to dead batteries is quickly and easily reprogrammed. Problem: Skeleton keys can easily be copied at the local hardware store leaving guest room safes an easy target. KingSafe's 15" laptop safes were designed with today's hotel guest in mind. Large enough to accommodate a 15" laptop, plus ample space for purses, cameras, iPads, cell phones, and many other travel accessories. Safemark's 17" laptop safes were designed to accommodate guests who travel with larger and/or multiple valuables. This safe series not only holds 17" laptops, but also has plenty of room to store purses, cameras, iPads, cell phones, and many other travel accessories. KingSafe's drawer safes are designed to accommodate the evolving guest room credenzas. Several options are available including pull drawers and those with hydraulic arms. Wall safes provide hotels with a unique alternative to the standard guest room safe. Our portfolio of wall safes includes both surface mount and in wall designs and each is available in 15" and 17" laptop sizes. Over the years, KingSafe Security has designed various safes to meet the evolving needs of hotel guests. Compatible with Pedestal- Safeplace offers a pedestal if the room has no shelf, closet or another place to install the safe. The pedestal offers an easy installation location at a comfortable height for easy use of the safe. Anti Tamper Function prevents manipulation of the internal mechanism when opening the back cover – the safe mode changes to service mode, offering you an additional security feature to your hotel room. Extreme safe and service units are programmed for a specific property. There is no universal tool which can be used in other hotels. Easy safe programming- DIY without the need of the third party. Only you know the internal password and the features you selected. This provides a higher security level for the hotel, cruise ship, university, etc. Audit Trail- Reports important information, up to 500 latest events stored with time and date. If and when a guest claim appears, it enables you to identify users and actions made in the safe at each moment. The events can be viewed and printed using the Ultimax or stored on file for later printing. Minibar Systems brings you SmartBox-the stylish and easy to use digital code safe at great value! SmartBox comes in two models: Laptop and Top Open. It is available in a variety of sizes to accommodate your guests' needs including a large laptop storage size. SmartBox features include audit software and emergency override functions. Its simple operation makes it the most user-friendly digital code safe on the market. Space optimization Built-in space can deposit camera, A4 folder,15 inch laptop,etc. Display feature Large LED screen can show power operation and programming information clew. Keyboard International Standard ADI digital button with blind spot, will never wear away. Internal Memory System can have the switch record on it's own, each record contains the user mode of operation,work type and exact operation time. Drive Mode DC speed-down motor drive, working life more than 300000 times; Intelligent detecting lock up system, have the self-preservation and the lock fuction. Locker System Double cylinder locker; high quality motor drive; smooth remove the door while opening and closing, without any noise. Door open protection With correct code, the door will be automatic sprang to 5 degrees. MaterialHigh quality A3 steel, 5mm door. Protection Design 4 times wrong password will be automatic locked 15 minutes,at same time, can choose the password hidden function. Craft Option Paint are not easy to fall off; press the button without voice every time. Low voltage Alarm After low voltage alarming, can still operate for more than 100 times; standby 168 hours. ESD antistatic design. ESD antistatic design. Senior measures With decoder operation. King Safe stands apart with a commitment to exceptional craftsmanship and the highest security standards. Offering the widest selection of product, our electronic safes are designed with modular components including digital keypad, CPU and locking mechanism. What does this mean to you Hotel staff can replace a door in seconds or individually components can be addressed when needed. In return, hotel guests benefit with a reliable and durable safe at their fingertips. Looking for Electronic Safe Lockers ?